Zeno’s paradox: How to explain the solution to Achilles and the Tortoise to a child. What Is the Answer to Zeno’s Paradox? Why Achilles actually can catch a tortoise in a race. Achilles, the fleet-footed hero of the Trojan War, is engaged in a race with a lowly tortoise, which has been granted a head start. Achilles’ task initially seems easy, but he has a problem. Before he can overtake the tortoise, he must first catch up with it. While Achilles is covering the gap between himself and the tortoise that existed at the start of the race, however, the tortoise creates a new gap. The new gap is smaller than the first, but it is still a finite distance that Achilles must cover to catch up with the animal. Achilles then races across the new gap. To Achilles’ frustration, while he was scampering across the second gap, the tortoise was establishing a third. The upshot is that Achilles can never overtake the tortoise. No matter how quickly Achilles closes each gap, the slow-but-steady tortoise will always open new, smaller ones and remain just ahead of the Greek hero. It’s tempting to dismiss Zeno’s argument as sophistry, but that reaction is based on either laziness or fear. Laziness, because thinking about the paradox gives the feeling that you’re perpetually on the verge of solving it without ever doing so—the same feeling that Achilles would have about catching the tortoise. Fear, because being outwitted by a man who died before humans conceived of the number zero delivers a significant blow to one’s self-image. But what if your 11-year-old daughter asked you to explain why Zeno is wrong? Would you just tell her that Achilles is faster than a tortoise, and change the subject? That would be pretty weak. 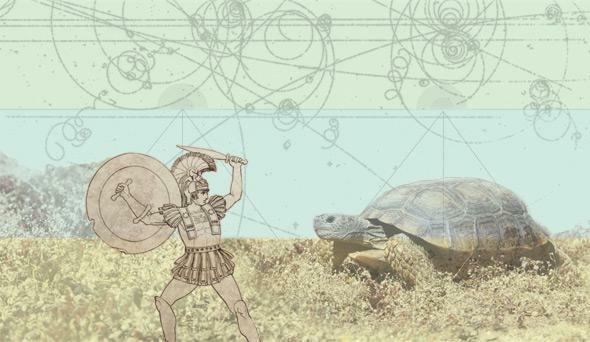 Zeno assumes that Achilles is running faster than the tortoise, which is why the gaps are forever getting smaller. But it doesn’t answer the question. Let’s see if we can do better. I consulted a number of professors of philosophy and mathematics. Most of them insisted you could write a book on this (and some of them have), but I condensed the arguments and broke them into three parts. Step 1: Yes, it’s a trick. But what kind of trick? The challenge then becomes how to identify what precisely is wrong with our thinking. Motion is possible, of course, and a fast human runner can beat a tortoise in a race. The problem has something to do with our conception of infinity. Step 2: There’s more than one kind of infinity. Achilles’ task seems impossible because he “would have to do an infinite number of ‘things’ in a finite amount of time,” notes Mazur, referring to the number of gaps the hero has to close. But not all infinities are created the same. There are divergent series and convergent series. The most obvious divergent series is 1 + 2 + 3 + 4 … There’s no answer to that equation. Or, more precisely, the answer is “infinity.” If Achilles had to cover these sorts of distances over the course of the race—in other words, if the tortoise were making progressively larger gaps rather than smaller ones—Achilles would never catch the tortoise. Now consider the series 1/2 + 1/4 + 1/8 + 1/16 … Although the numbers go on forever, the series converges, and the solution is 1. As long as Achilles is making the gaps smaller at a sufficiently fast rate, so that their distances look more or less like this equation, he will complete the series in a measurable amount of time and catch the tortoise. The secret again lies in convergent and divergent series. For example, the series 1/2 + 1/3 + 1/4 + 1/5 … looks convergent, but is actually divergent. If Achilles runs the first part of the race at 1/2 mph, and the tortoise at 1/3 mph, then they slow to 1/3 mph and 1/4 mph, and so on, the tortoise will always remain ahead. But don’t tell your 11-year-old about this. It will be our little secret. Step 3: It’s more than a theory. If your 11-year-old is contrarian by nature, she will now ask a cutting question: How do we know that 1/2 + 1/4 + 1/8 + 1/16 … adds up to 1? No one has ever completed, or could complete, the series, because it has no end. The conclusion that an infinite series can converge to a finite number is, in a sense, a theory, devised and perfected by people like Isaac Newton and Augustin-Louis Cauchy, who developed an easily applied mathematical formula to determine whether an infinite series converges or diverges. But thinking of it as only a theory is overly reductive. The convergence of infinite series explains countless things we observe in the world. Not just the fact that a fast runner can overtake a tortoise in a race, either. Any distance, time, or force that exists in the world can be broken into an infinite number of pieces—just like the distance that Achilles has to cover—but centuries of physics and engineering work have proved that they can be treated as finite. That answer might not fully satisfy ancient Greek philosophers, many of whom felt that their logic was more powerful than observed reality. But the way mathematicians and philosophers have answered Zeno’s challenge, using observation to reverse-engineer a durable theory, is a testament to the role that research and experimentation play in advancing understanding. It should give pause to anyone who questions the importance of research in any field.